Regular game time in the form of 19 appearances in all competitions this season means Stuart Morrison’s development loan from Dunfermline to Edinburgh City can be appraised as a successful one. Morrison, who has been involved in Scotland Under-19 squads, has been a regular feature of City’s back three this term, under both Gary Jardine who brought him to the club, and current boss James McDonaugh. Ryan Porteous’ recent prominence in the Hibs first-team squad after spending last term as a temporary City defender is a perfect example of the potential longer-term benefits of a season away from a parent club. Morrison is hopeful his game time in the black and white of City will lead to similar when he dons the same colours back at East End Park. “It’s been really good. I’ve come in and played basically every game,” he said. “I was injured at the start of the year and it was just my luck that the two games I missed out on, we won, so I had to wait until I got back in the team, but that’s just football. Having initially signed until January, it was an easy decision for Morrison to extend his stay at Ainslie Park until the end of the current campaign. With Dunfermline not running an Under-20s side this season, his move more than most highlights the usefulness of the development loan system, both for City and the Pars. “The loan was only just until January but because I had been playing every week, there was no point in trying to get a different team,” Morrison explained. “I’m enjoying playing every week, working under James and with all the boys and I’m looking forward to hopefully finishing the season strongly. 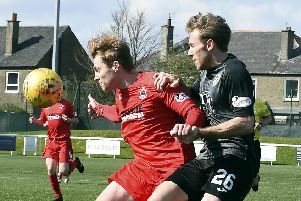 “There isn’t a Dunfermline 20s team this season after they scrapped it at the end of last year, but we’ve still had bounce games here and there. We’ve had a few lately including one this week and I feel like I’m going in to those, and training at Dunfermline, a stronger player. We train with the first team every day and I feel like I’ve come on a lot. I’m coping with the physical side of the game a lot better, which is what was needed to go out and play against grown men. “I’m definitely a better player then when I first arrived. I’d been playing under-20 football for the past two or three years so the next step was first-team football. I obviously wasn’t going to get that at Dunfermline and the first club to come in for me on loan was Edinburgh City, so I jumped at the chance. “I just live across the bridge so it’s easy to get to training and I thought I’d get a good chance at playing. Thankfully, Gary Jardine chucked me in the day after I signed and I kept my place right up until I got injured, so I’ve been happy with it. A change of both manager and defensive colleagues at City didn’t make for the smoothest time, but with the managerial and defensive trio now settled, Morrison is reaping the rewards. “When I first started I was playing in a different defence every week,” he recalled. “The team chopped and changed a lot but the last few weeks it’s been a settled back three with Pat Scullion, Jesus Garcia Tena and myself.